A healthy Gulf of Mexico relies on healthy communities of fish and other marine life. Thanks in part to EDF members and activists, big improvements in the way commercial fishermen harvest fish are helping restore the Gulf. Unfortunately, failing management of recreational fisheries and promoters of the status quo are putting conservation success at risk. Please use this form to send a personalized message to the National Oceanic and Atmospheric Administration (NOAA) urging them to support stronger recreational fishery management. New management of commercial fisheries has put the recovery of the Gulf’s fish populations on a path to recovery. However, offshore recreational fisheries have been left behind. Outdated management of recreational fisheries causes far more fish to be killed than scientists recommend. This punishes both anglers and the environment. Recreational fishermen need new ways to operate that help restore and sustain fish and better serve recreational fishing businesses and anglers. 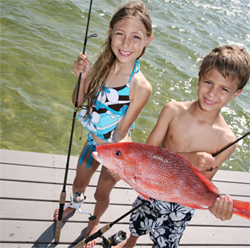 The Gulf Headboat Cooperative's pilot program provides an opportunity to fish for red snapper and gag grouper under safe catch limits, to accurately report catch to fishery managers and scientists, to reduce waste caused by regulations, and to use their limit of fish in a way that is best for business and the environment. The Gulf Headboat Cooperative offers an opportunity to lead the way for sustainable fishery management in the Gulf of Mexico. The program is a win-win-win for anglers, fish, and new management ideas. I am writing today to request that you approve the Exempted Fishing Permit application of the "Gulf Headboat Cooperative" to engage in a voluntary two-year pilot program for up to 20 vessels to test an allocation-based system to save fish and provide better opportunities for anglers and their families.